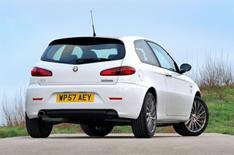 Alfa Romeo launches special-edition 147 | What Car? Alfa Romeo is launching a special edition of its 147 small family car. If the Collezione name sounds familiar, it's because there was a similar edition last year. Alfa Romeo says it sold so well that it has decided to launch a new version for this year. To distinguish it from last year's model, the 147 Collezione will be finished in unique Ghiaccio white paint, and there'll be the 500 option of a gloss black roof, too. The car also has lowered suspension, a leather interior and unique 17-inch alloy wheels. There are two engines: a 120bhp 1.6-litre petrol, or a 120bhp 1.9-litre diesel. These power the car from 0-62mph in 10.6 and 9.6sec respectively, and on to top speeds of 120mph and 121mph. Other equipment includes air-conditioning, steering wheel-mounted stereo controls, six airbags, traction control and an alarm. The 147 Collezione is available in three- and five-door versions, and costs from 13,950.